"Shipping Promotion" add-on allows you to give your customer some bonuses if they choose the certain shipping method. For example: you have an ability to set the promotion that if a customer chooses FedEx shipping method he will get certain products for free or he will get the discounts on certain products. 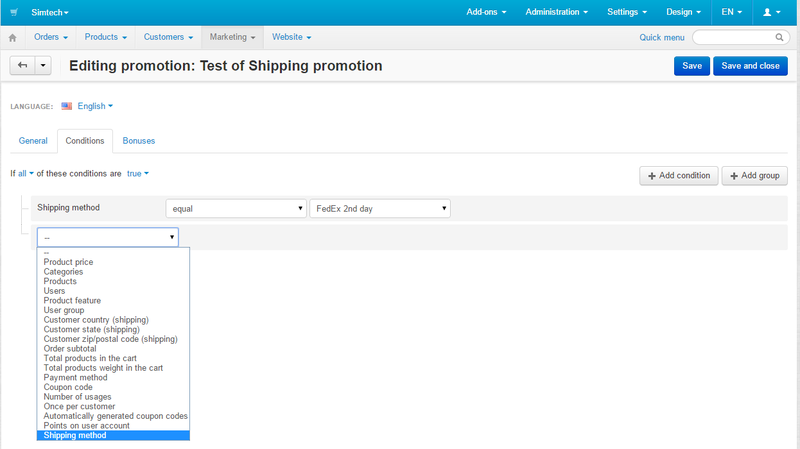 The additional condition "Shipping Method" is added to the cart promotion settings. The standard CS-Cart bonuses for the cart promotion is available for the chosen condition "Shipping Method"
1. Download the archive with the Shipping Promotion add-on. 4. In the list of add-ons find the Shipping Promotion add-on and click Install opposite to its name.